VietNamNet Bridge – A number of streets in Tan Phu District, as well as canals and arroyos in the area, are full of waste. On August 15, at the waste collection point on Binh Long Road in Tan Quy Ward, heaps of industrial waste were piled up on the sidewalk, tens of meters in length. As the amount of waste was large, it encroached on the road edge and bed. The waste water was leaking, producing a bad odor. The industrial waste included rags, sponges, packages, leather and plastics, which, mixed with domestic waste, attracted flies. Glass bottles and medicine vials were also thrown on the dumping ground. 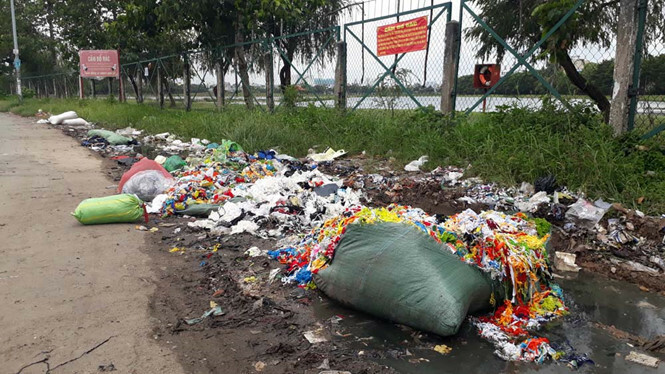 The huge waste dump even surrounded the crime prevention station of the Binh Hung Hoa A Ward Police in Binh Tan district, despite a signboard which said ‘no dropping of litter’. A local man said sanitary workers collect waste in the area every day. However, they only have the responsibility of collecting domestic waste, while the industrial waste has been left there for a long time. A number of streets in Tan Phu District, as well as canals and arroyos in the area, are full of waste. Some local residents collected waste in small heaps and burnt the waste, creating thick columns of smoke. Trinh Van Thai, 65, affirmed that the heaps of garbage have been ‘generated’ by some people in the locality. “They throw waste at 1-2 am, so they have not been discovered,” he said, adding that some families in the locality have left because the bad odor became unbearable. Kieu Thi Nga, 55, who lives in front of the garbage dump, said local residents always have to wear protective masks, day and night. She has to keep the doors closed all day, or scraps of fabric will flow into her house. Unlicensed dumping grounds have also appeared in Binh Tan district. Heaps of garbage can be found everywhere, including in the places with warnings about CCTV cameras. A sanitary worker seen collecting waste on CN1 Road in Tan Phu district said that her team is in charge of collecting only domestic garbage and bringing it to the waste collection point before the waste is carried to treatment plants. “We sometimes also have to collect industrial waste. But more waste will appear on the following days,” she said. The director of a public service company said that under current regulations, the companies like his are not allowed to collect and carry domestic waste together with industrial waste. The collection of industrial waste will be implemented independently when the owners of waste sources sign contracts with the companies. In this case, when industrial waste is thrown underhand, local authorities must take responsibility for the treatment.